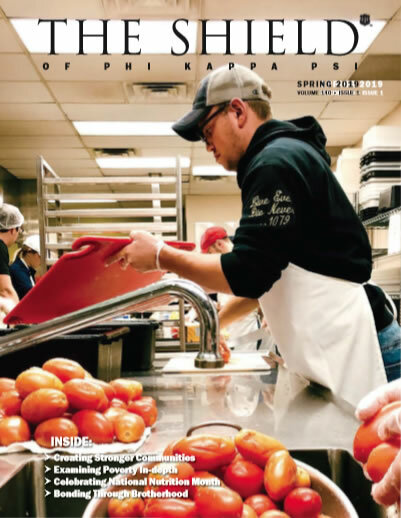 The Shield of Phi Kappa Psi is a quarterly publication that is mailed to alumni around the world. It is the single easiest way for our alumni to stay in touch with the Fraternity, keeping up with the local chapters and associations, discovering news about the Fraternity nationally and also the business of Phi Kappa Psi. Founded in 1879 by two dedicated brothers, it has served the Fraternity for over 130 years. Read more about our history. All members of the Fraternity are subscribers for life, with the online access now bringing every issue of the magazine to any willing reader around the world. Do you enjoy learning about our chapters, alumni and unique stories of Phi Kappa Psi? Almost all of the information you read inside each issue of The Shield is submitted (in some form) by our members. While we are limited in space, there is always a forum for member submitted information. We encourage you to submit any information, obituaries, article ideas or content to the magazine. We also strongly encourage pictures. For print quality, we request images be 300 ppi or higher.